To celebrate the launch of Pony Studios, a revolutionary new hair education space in Oakland, California, Michael had a chat with Pony founder, owner, and Bumble and bumble alum Corinna Hernandez to talk about her story, her career thus far, and her vision for her new space. MG: So, how are you? Are you excited? Did the launch weekend go well? C: The class was good. It went very well, we got really great feedback, and we only had a few minor audio/visual hiccups. Are you ready for a question? Yes! When did you get into hairdressing? It was 1999. How did it happen? I met a hairdresser, Collette LaRoche, who really inspired me. I saw this girl walking around with a cute haircut, whose hair was similar to my texture, and I asked her who cut it. I booked an appointment with her hairdresser. It took me two months to get in. And I loved her. I loved her personality, her stories. She said she made really good money and went to Paris three months out of the year, and came back to work to her clients and she felt like it was play and not work. I mentioned that I thought about doing hair at one point and she told me to go for it. So I left there and immediately signed up for beauty school. Where did you go to beauty school? It was in Sacramento, California, at a place called Federico Advanced. I went to the night school, so it took two years. Were you working during that time? I was actually an office manager at a physical therapy office. No kidding. And how long were you in Sacramento? Well, when I finished beauty school, I met Rowena [Hiraga], who had just left the Sassoon Academy to start her own salon. At this point, I had started working at a pilates studio, and she was taking classes. I heard that she was a hairdresser, so I introduced myself and told her that I was in beauty school and just about to graduate. She said, “You should come work for me. I’m just starting my salon and I just left Sassoon, and you’d be my first hire.” And so I did it, I went to work for her. That was in El Dorado Hills. That wasn’t necessarily where I wanted to be, but I did want to learn from her, so off I went. Did you enjoy it? I did, I really liked it. I felt like it was my thing. At first it was a little weird, but I kind of fell into it. I started going to New York to Bumble and bumble to train for the Network Educator position at her salon. I started being trained by Amanda Rich and Kevin Perryman, and I learned how to teach, how to speak publicly, all that. So that was very different from the Sassoon method that you had learned. Yes, very different. But even when I worked with Rowena, we carried Bumble and bumble and I was very drawn to its aesthetic. That was always the kind of hair I wanted to be doing; the Sassoon technique wasn't really enough for me. When I started learning to cut with a razor, I was surprised at the amount of technique that was built into it. At the beginning, it was hard for me to not over-fix my cuts and to stop trying to make them look like scissor cuts. I had a hard time trying to break away from the discipline of scissor-cutting and not really looking at the person. My biggest takeaway from Bumble and bumble at the beginning was how to really look at the person, how to look at the hair, and how to make them work together. When did you start assisting at Bumble and bumble? It was 2004. I very quickly went from renting my station to making minimum wage, but feeling excited about it. I was at a point in my career where I was ready to be a student again. I loved learning, so I was happy being in that position. Coco [Santiago, hairdresser and educator] was my first teacher. Were you downtown or uptown? I started uptown. Betty [Skier, salon manager] hired me over the phone. The first day, no one knew who I was and Betty was on vacation. Looking back, it was kind of funny because no one had any idea that I was going to be there, but they told me to just go to the floor and observe. I felt very out of place. Is that when we first met? Well, I actually met you before I started with Bumble and bumble, before I moved to New York. I met you while you were out on the road, and I was in line to get my Hair Heroes book signed by you. You asked me if I was a great hairdresser. That really made me pause, but my friend was with me, and she answered, “Yes” for me. So you wrote, “To a great hairdresser” in my book and signed it. It was really the best, most exciting time. I was learning so much from people who knew more than me. I just want to share that and keep it going. Oh, that's a nice story! I suppose what you’re doing now is very influenced by what you learned at Bumble and bumble, right? Absolutely. It was really the best, most exciting time. I was learning so much from people who knew more than me. I just want to share that and keep it going. Did you have to learn Scottish? I did have to assist Raymond [McLaren, brother of Howard, another legendary hairdresser and educator] once and I was so scared. I can imagine. He looked like a character in Harry Potter. Right! When he looks at you, it feels like he’s looking deep into your soul. [Both laugh]. What do you think was the most important lesson you learned there? I distinctly remember listening to you speak during meetings. You always told us to document our work, and to take 50 photos in order to find one that's really great. Using and developing my eye were really huge lessons for me, as well. A lot of the things that still help me today were the public speaking that we worked on with the educators, as well as working with the acting coach they hired. Another big one was working with Amanda on how to open, organize, and close a class. I never knew I would end up doing what I’m doing now, but all those things continue to help me every single day. So what happened after Bumble and bumble? Did you go back to the west coast? They were starting the Bumble and bumble Live program. I kept hearing that they were looking for people to go out into the field and teach. No one I had spoken to about it was into the idea, but one day I ran into Amanda and said, “Can you tell me more about it?”, and she explained the job a little further. I asked if they would move me back to the west coast, because I really wanted to go back home, and she said, “Yeah we’ll send you back, and we’ll give you a car and a laptop and a phone.” So I did it. I was the first person to leave Bumble and bumble in New York to pursue that, which resulted in me teaching 4 days a week in a different salon every day for four years. Tell us about Pony. What is Pony? I originally just wanted to open a simple salon, and I had the idea to call it “Pony” after the ponytail, which was a style we seemed to always be doing backstage, and which is harder to execute than most people think. Then, the prices in San Francisco started going up, and I just didn’t feel like I could afford to open a salon. It wasn’t really until this year that I felt like I could do it. I live in Castro Valley, where there are about 60,000 people, and I knew I didn't want to do it there. So I landed on Oakland, which is between my home and San Francisco. When I saw this space, I knew it was meant to be an education space, and it became a little theater. I always thought Pony was just going to be a salon, but it has become so much more. And now you’ve just had your first teaching session at Pony. How did that feel? It was so exhilarating to have my own space. Before, every time we had a class we would have to borrow space, bring in all of our own stuff, and break it all down ourselves when the class was over. This time, it was just all here, which was so relaxing. I was still nervous, and I still felt like everything was going to go wrong because that's how I always think. But it went really well. Everyone was great, and I know it’s only going to get better. What's your biggest hope for the new place? 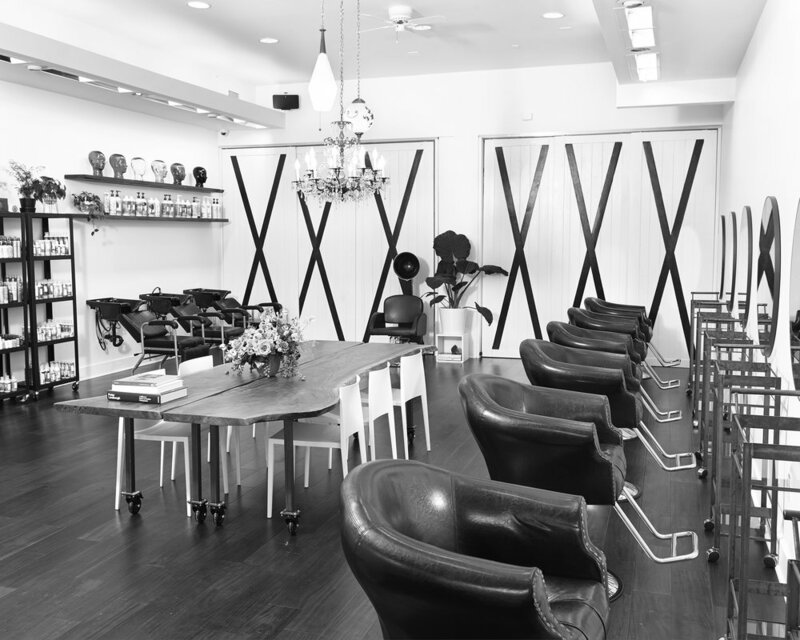 That it becomes a space where hairdressers can learn and grow and feel like a part of their community. That’s always been my goal. That's a great goal. What is the most important thing you want people to take away from Pony? To learn to take responsibility for their careers. That it's up to them and that its in their hands. I want them to work hard for it, and I want them to walk away feeling empowered, excited, and inspired. I want them to feel more knowledgeable than when they came in. It’s so interesting that you have all these great hairdressers that came from Bumble and bumble. It must feel like a bit of a reunion to have them all on the education calendar. People from Bumble and bumble are really excited. I find that a lot of alumni are coming to me and offering their help. Everyone's very graciously volunteering their time, and they're all getting paid, but it's definitely not what they’re worth, so I am very grateful. I hope that someday soon I can pay everyone what they really deserve. Well, they want to support you, and they want a place to come teach. I think the huge shift to renting chairs that we’ve seen recently has left a bit of a vacuum. And I guess you and all of the others that had a positive experience at Bumble and bumble miss that feeling of community and mentorship and education. [Bumble and bumble] was the best, it really was. What you did there brought people from all over together. The other day, on one of my posts, Raisa [Cabrera] commented that “Pony feels like home.” That made me feel really great, because that was always my intention. All of the Bumble and bumble alumni you mentioned have very different styles. What was the process of selecting and assembling this team like for you? Everyone that's currently on the roster had reached out and asked if they could be a part of it, except for Dennis [Lanni]. He was someone that, with butterflies in my stomach, I reached out to for help. He’s always been a standout for me. He always made everyone feel so comfortable, and safe to make mistakes. He doesn’t let the stress get to him. He's mindful and thoughtful and cool as a cucumber. He's one of those hairdressers that has an instantly recognizable signature style, and I wanted him here because I love his energy, his art, and the way he does things. He called Pony “unplugged”, which I really liked. I think what you’re doing with Pony is filling a void. The kind of training that you and your peers had doesn't really exist anymore, so I think you’re going to do extremely well, and I wish you the very best. Thank you so much. That means everything to me. I’m just blown away by what's happening, because in some ways I used to feel invisible to so many of the people I’m working with now. They are people who I always looked up to and who have taught me so much. I hope to return the favor to the new generation of people that come to learn at Pony. Join Corinna, Michael Gordon, Dennis Lanni, Ramona Eschbach, and more for demos and an industry mixer at the Pony Studios Launch Party on March 10th, in Oakland, CA. Tickets can be purchased at ponyeducation.com.